Nova Delphini 2013 – It’s official! 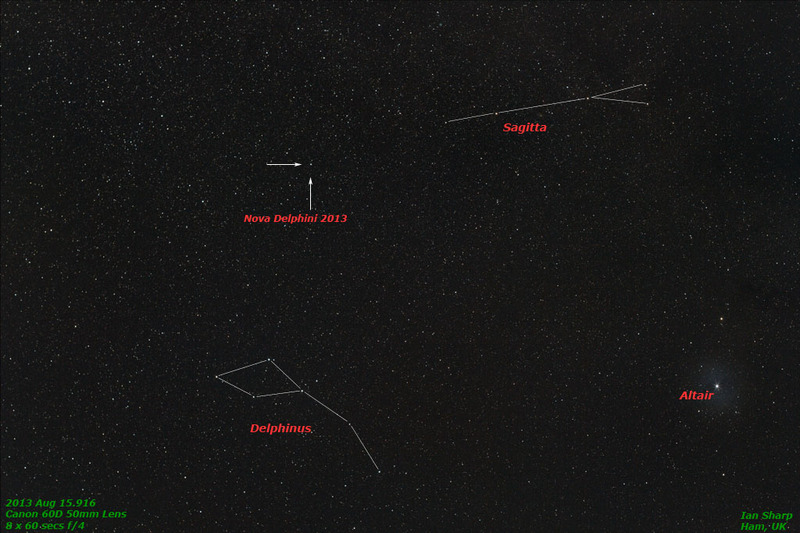 General Astronomy Comments Off on Nova Delphini 2013 – It’s official! 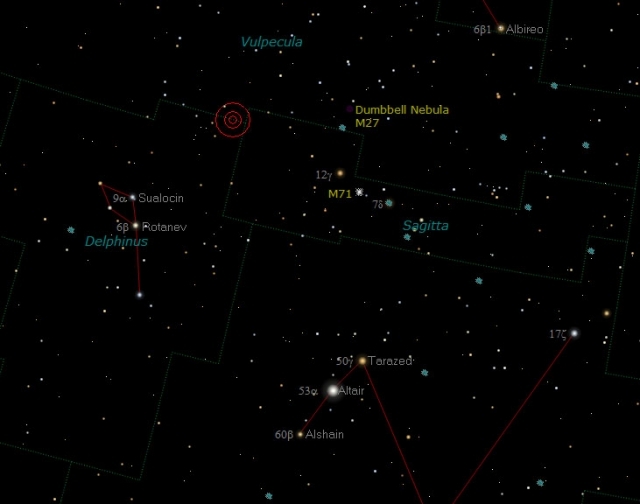 The possible nova with the catchy designated name of PNVJ20233073+2046041 has now officially been named as Nova Delphini 2013. It was clear here last night for an hour or so just as the sky was dark enough for me to make out the stars in Delphinus and Sagitta, so I took this shot of the new star with a 50mm lens on a Canon 60D. 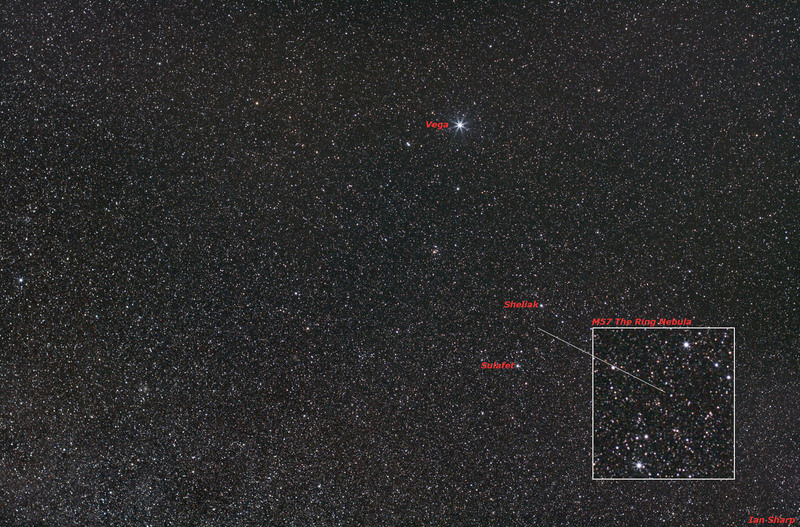 I’ve annotated the image so that you can where to find the Nova. A bright Nova has appeared in the little constellation of Delphinus (The Dolphin). 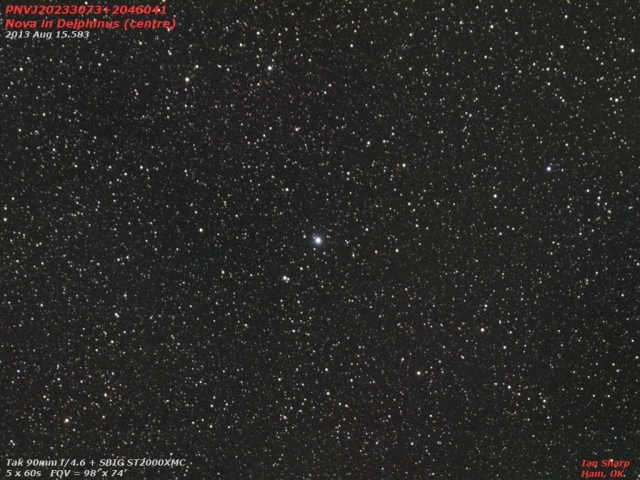 It is on the limit of naked-eye visibility, at roughly magnitude 6.3, but binoculars will show it well. Here is an image I took of it this morning from a telescope in Australia, but it is well placed now for Northern hemisphere observers, and I hope it might be clear enough tonight to photograph it from here in the South of England. Below is a map showing the constellation of Delphinus relative to Altair in Aquila and Albireo the head star of Cygnus the Swan. The position of the Nova is marked by the red circles. Click on the map to see a full size version. This Nova, discovered by Japanese amateur Koichi Itagaki, is caused in a double-star system when material from one of the Stars builds up, or accretes on to its companion star (normally a white dwarf) until it undergoes a thermonuclear explosion and brightens very dramatically. 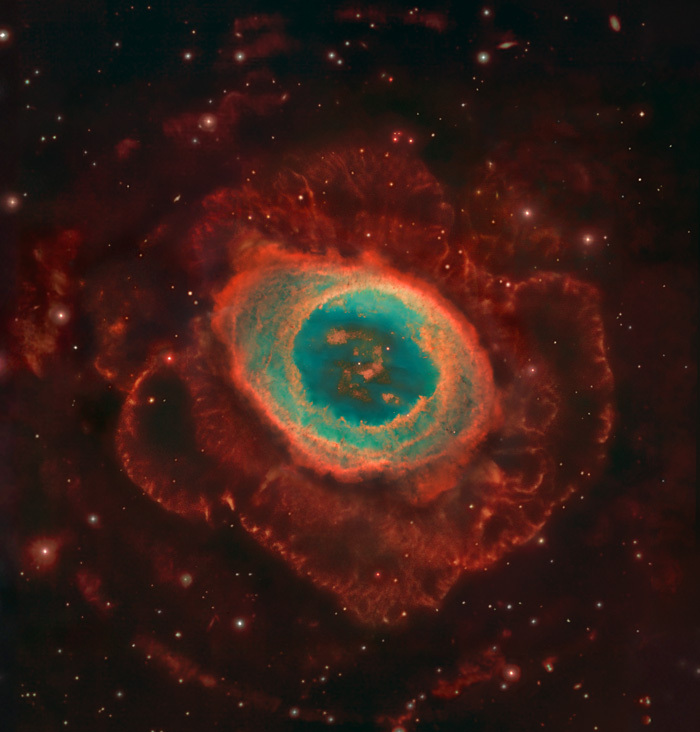 What was it about The Ring Nebula (M57) that inspired me to put together this little blog article? I guess it must be that it was the first telescopic ‘deep-sky object’ that I ever learned how to find and observe . (I didn’t call them deep-sky objects back then and the brighter wonders such as the Andromeda Galaxy and the Orion Nebula which are visible to the naked eye don’t count! ) I remember using my 60mm Tasco refractor back in 1971, as an 11 year old to look at this lovely object, and was amazed by it. Within a few months I would see it in Patrick Moore’s 12″ Newtonian Reflector – well what can one say – incredible! It was always likely to be M57 (out of many other objects) because it is really easy to find, located as it is between two stars in the ‘parallelogram’ of Lyra the lyre. Also, Lyra itself is easy to find because of its brightest star Vega, and the fact that Lyra is a compact constellation right next to it. Before we go zooming in on M57, what exactly is it? It is a planetary nebula, so called because, at first glance, it presents a planet-like disk to an observer through the telescope. However, instead of being at Solar System distances, it is roughly 2,500 light-years away and was formed when a dying red-giant star blew out its outer layers before becoming a white dwarf. Such a fate will probably befall our own Sun in about 5 billion years! Now, we see the remaining shell of ionised gas as it expands into the interstellar medium. So, the idea behind this blog is to locate M57, and zoom into it using images that go from wide-angle camera shots to high resolution images from large telescopes. 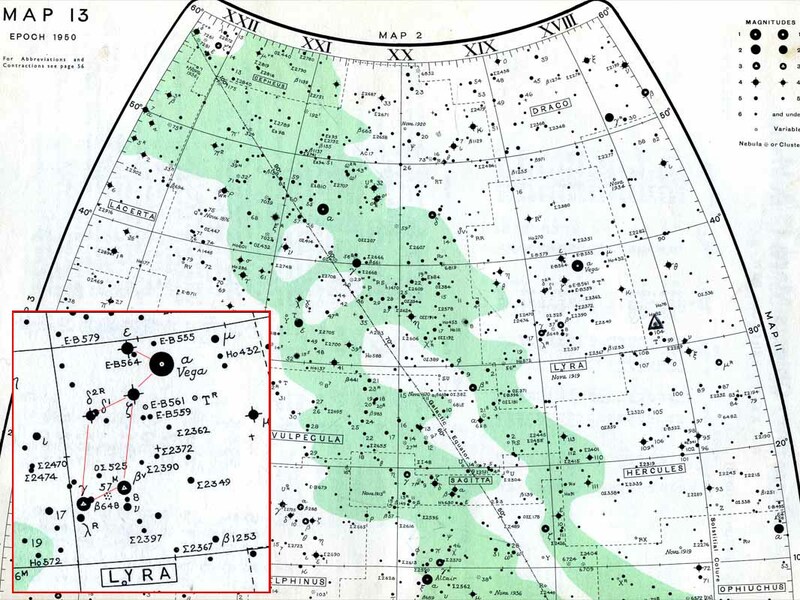 First, I’ll transport you back to my world of the early 1970’s by showing this scan from the wonderful star maps at the back of the classic Norton’s Star Atlas. I still reach for this book when I need to remind myself of various bits of the night sky! Here is the scan, I added the insert showing Lyra at a larger scale, but the map itself in very evocative to me, covered with the rubbed-out tracks of pencil-drawn trails from long-gone Perseid or April Lyrid meteors. You will see M57 indicated between the stars β (Beta) and γ (Gamma) Lyrae at the bottom of the parallelogram shape (which I have outlined). Now, on to the first image. I took this back in early June this year using a Canon DSLR camera and an 18mm lens, giving a nice wide field view. (as with all these images – click on them to see them at full size, then click again to return). 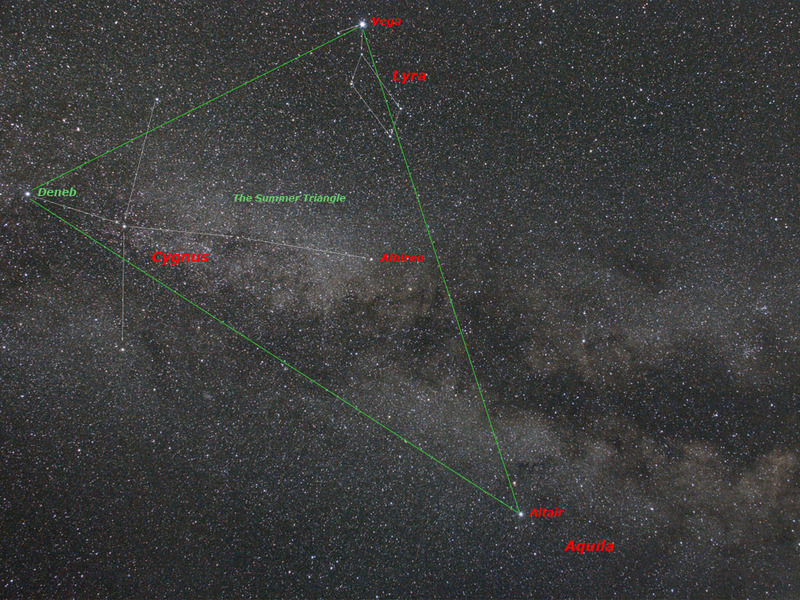 I have indicated a large green triangle which is known as The Summer Triangle consisting of the 3 bright stars Vega, Deneb and Altair. I have also annotated the cross shape of the constellation of Cygnus the Swan which is getting rather swamped by the Milky Way in this picture. You can see Lyra near the top. The next image is only a bit more of a close up Lyra, taken with a 28mm lens this time. 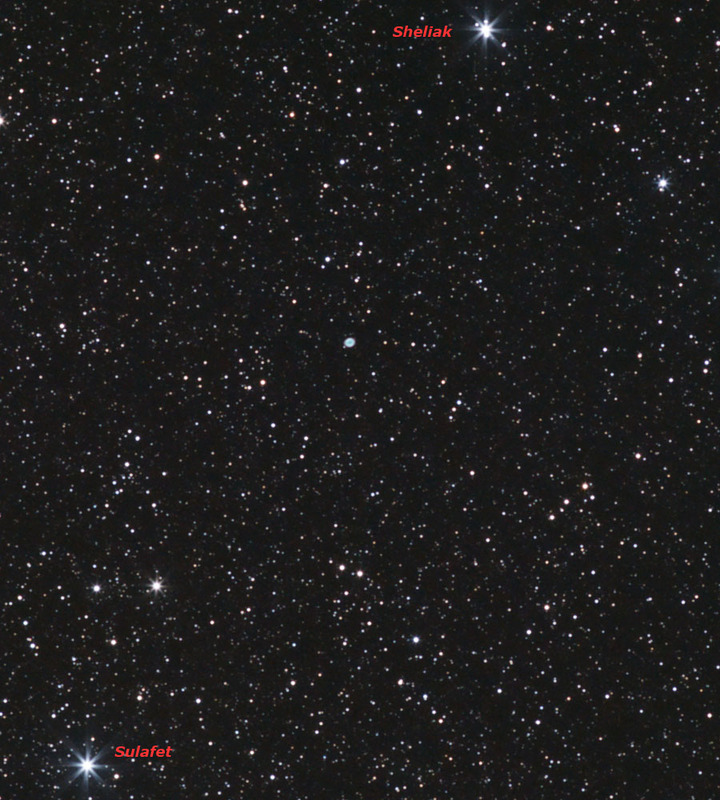 I have added the names of the two stars that straddle either side of the ring nebula. 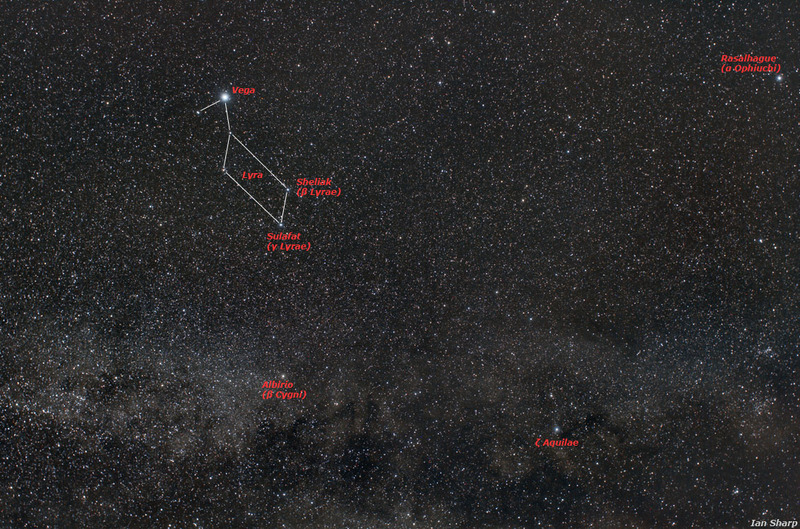 As you can see Beta Lyrae has the proper name of Sheliak, and Gamma is called Sulafat. 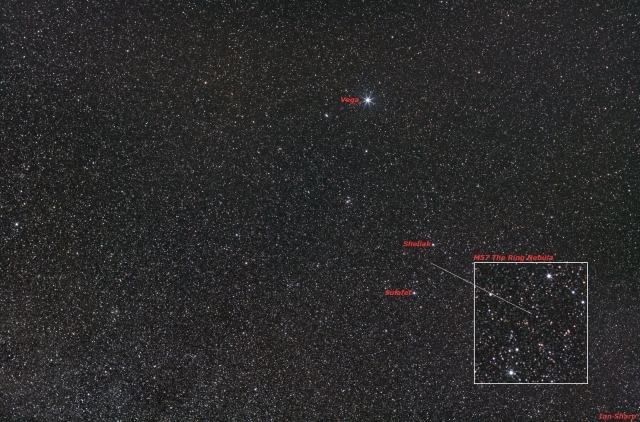 Also annotated are a few of the other brighter stars in this field – Albireo is the head (or beak) star in the cross of the Swan. Many of the proper names of stars in use today come from an Arabic origin and Sulafat comes from the Arabic for ‘turtle’ or ‘tortoise’ as it seems that most fine harps (or lyres) were decorated in tortoiseshell. So, let’s zoom in a bit further. Next I changed to a 50mm lens and have also added an insert to this image. The insert is at the full resolution of the image whereas the rest of the picture has been much reduced in size to get it on this page. Now we can actually see the Ring Nebula! It’s pretty small as you can see, in fact it is approximately 3.5′ (arc-minutes) across which is, roughly speaking, only one tenth the apparent diameter of the Moon. 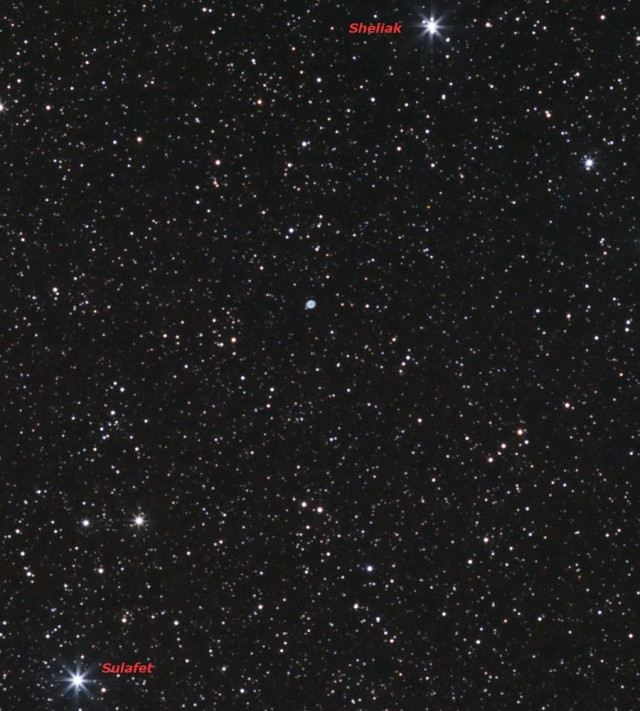 Note the use of the word ‘apparent’ there; The true size of M57 is some 3 light-years across! Now the last camera shot, before moving to a ‘proper’ telescope (telephoto lenses are telescopes really, but you get the idea). This time, I used a 200mm lens and I have cropped out the Sheliak/Sulafet region. Now we can see the ring and can understand why this is known as a planetary nebula. It certainly confused its discoverer. French astronomer Antoine Darquier de Pellepoix in January 1779, reported that it was “…as large as Jupiter and resembles a planet which is fading.” This is a good description as Jupiter is typically about 45′ across, but much brighter of course! Another Frenchman, Charles Messier, independently found the same nebula later on in the same month while searching for comets. He entered into his famous catalogue as the 57th object (Note that the main reason for Messier’s famous list was so that he would remember these ‘fuzzy’ objects and not confuse them with Comets which were his main interest). The following image was taken with my Celestron C11 telescope and an ATIK 383L cooled CCD camera. I used a filter called an H-Alpha filter which passes light in a very narrowband of frequencies. I was after the outer shell of M57 – something I had never really seen in older photographs, but nowadays it is commonly captured by amateur astronomers using sensitive CCDs. It does require long exposures to bring the faint outer shell out, and I stacked together several 20 minute exposures to reveal it here. 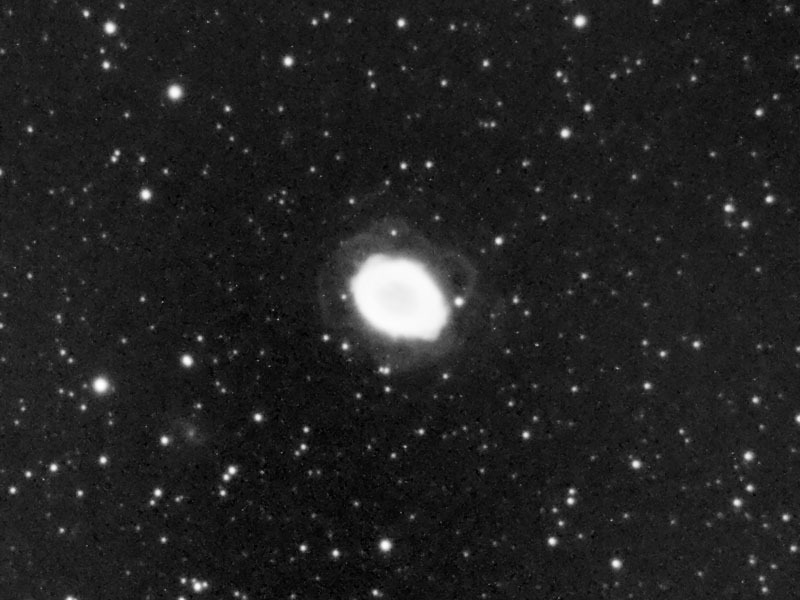 That’s it for my take on M57. Maybe I’ll make the Zoom into theme a regular feature here, so watch this space! I haven’t blogged for a while, and I have some catching up to do! So, here are 3 images I took over the period April to June. From June until early August in the South of England, the nights are very short and I don’t tend to be very productive in terms of deep-sky imaging, that’s one reason for using remote telescopes in other parts of the world. (but more about that in another blog). All of these were taken using my trusty old Celestron C11 Schmidt-Cassegrain telescope with an AstroPhysics 0.67x reducer, giving an f-ratio of f/6.7. The CCD camera was an ATIK-383L mono with Baader 2″ filters. Guiding was achieved using a Starlight Xpress Off-Axis Guider unit (OAG). The whole lot rides on my AstroPhysics AP900 mount (which is currently out of action due to a dodgy Dec-axis encoder!). 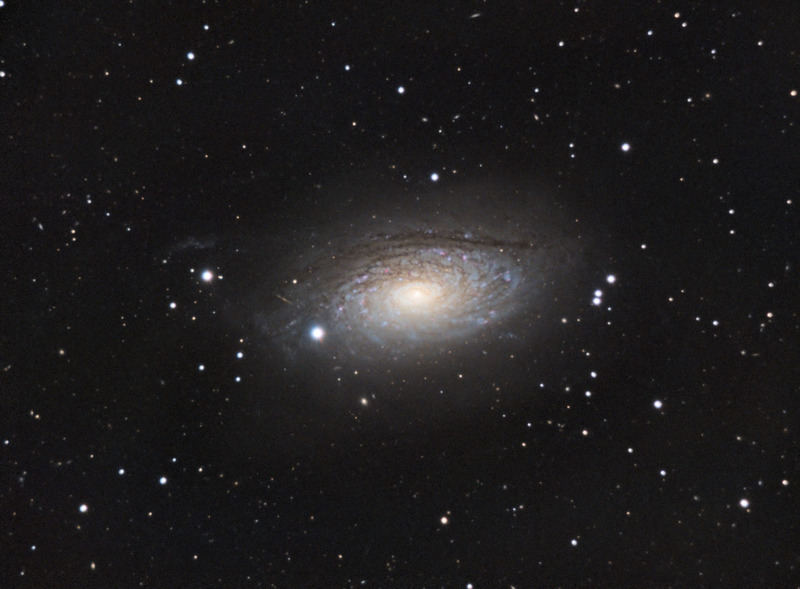 The first one is Galaxy M63 (also known as NGC 5055, or the Sunflower Galaxy). This is a spiral galaxy in the constellation Canes Venatici consisting of a central disc surrounded by many short spiral arm segments. 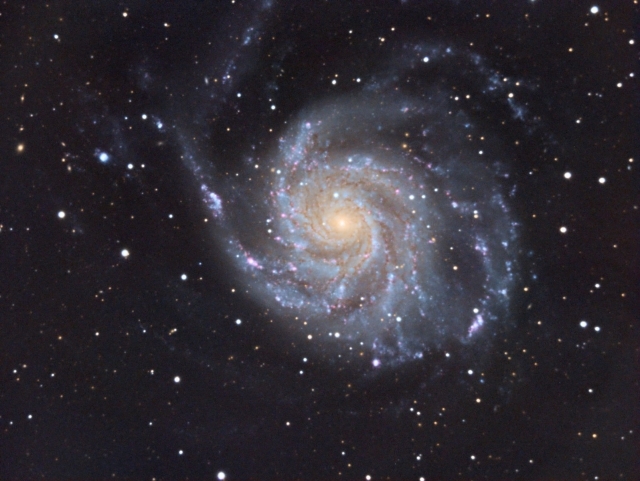 M63 is part of the M51 Group, a group of galaxies that also includes the more well-known M51 (the ‘Whirlpool Galaxy’). Next we have the biggest and best Globular Cluster in the Northern Hemisphere. 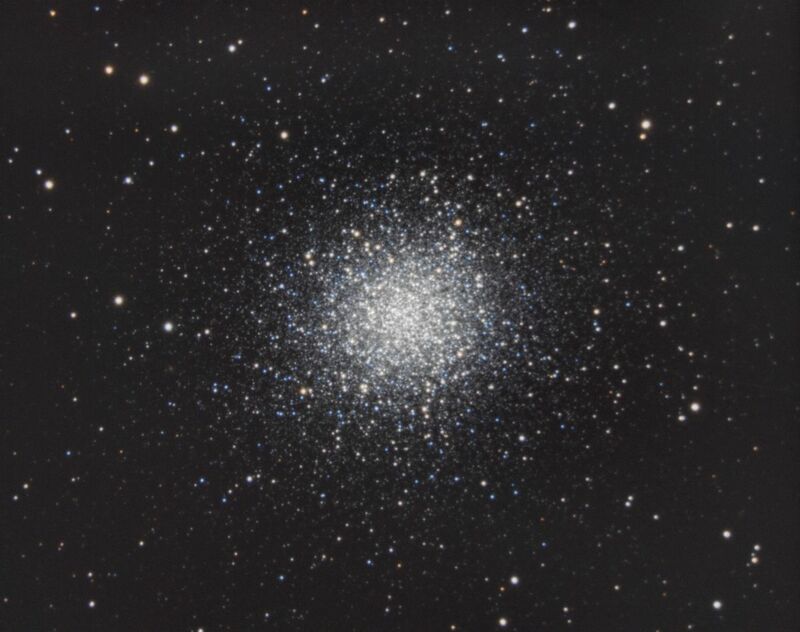 M13 is also known as the Great Globular Cluster in Hercules, and contains about 300,000 stars. Finally, I’m very pleased with this image of the lovely face-on spiral galaxy M101. This galaxy, in Ursa Major is some 21 million light-years away, and is also known as the Pinwheel Galaxy.